Gabriel Mosher of Swanton in the warm up for Saturday’s NWOAL Bowling Championships at Swanton Sports Center. She rolled a 488 series for the Bulldogs, who finished third as a team. Derek Floyd of Swanton in action Saturday at the league bowling tournament. The Swanton boys finished third overall behind Bryan and Patrick Henry. 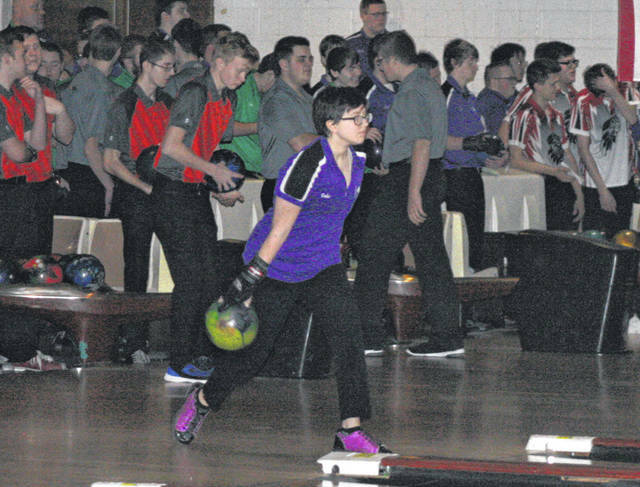 The Northwest Ohio Athletic League Bowling Championships were held Saturday at Swanton Sports Center as Bryan was victorious in both the boys and girls competitions. Swanton took third in both matches. In the final league standings, the Swanton girls finished second while the boys took third. The Bryan boys won with a score of 3,894. Next was Patrick Henry at 3,764, Swanton with 3,687, Wauseon 3,660, Delta 3,504, Evergreen 3,333 and Liberty Center 3,084. 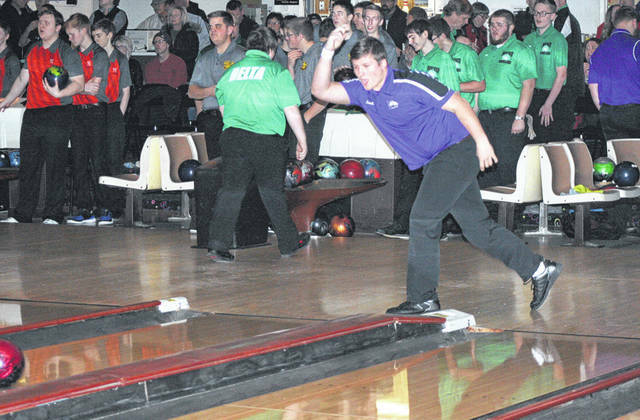 Swanton got a best score over three games from Michael Lawniczak who rolled a 551 series. Aaron Futch was next with a 547 series, Alexander Hicks 537, Derek Floyd 496 and Devon Crouse 482. Cory Waugh rolled a 603 for Delta, Gabe Syverson 574, Blake Brauer 551, Will McQueen 540 and Kaden Hawkins 315. CJ Langenderfer had a 567 for Evergreen. Wil Newcomb added a 529, Cade Johnson 523, Ethan Shively 481 and Ayden DeGroff 294. Bryan won the girls match with a 3,324 score. Liberty Center was next at 3,024, Swanton 3,022, Wauseon 2,829, Delta 2,761, Patrick Henry 2,556 and Evergreen 2,264. Amy Lawson paced the Bulldogs with a 574 series, the highest of the tournament. Gabriel Mosher added a 488, Hanna Patch 482 and Kylie Ulch 265. Delta got a 522 from Alli Hite. Echo Sniegowski added a 447, Ramzie Hockenberry 304, Payton Gladieux 252, Maddy Johnston 250 and Alexa Tenney 206. Breeanna Riegsecker paced Evergreen with a 440 series. Delaney Burghardt rolled a 372, Hannah Mohr 331, and Kennedy Coolman 268.